OK! Let’s talk about getting started on this Farmer’s Wife Quilt. I’m super impressed that so many of you are off and running with making your blocks. Some of you have a dozen or more done already! Some of you, I hope, might be like me and getting off to a slower start. Either way, there’s no rush and no rules! Most important is having fun making these blocks and sharing the process with each other. The templates that come on the CD in the book don’t have the best layout. They use up lots of paper. Liz A has created a document with all the templates laid out on just 15 pages. You can download it here. She also recommended having your template pages laminated at Staples and then cutting them out as you go along, rather than using template plastic. I am trying this out and I like it so far. There is a great discussion on the Flickr group here about different ways that people are using the templates. If you would like to foundation paper piece, there are templates that have been created for that as well. Take a look at this post by Jessica, to learn more about how you can download that template file. 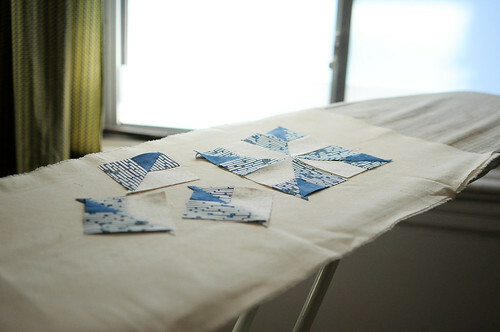 Another intriguing idea is printing the templates onto freezer paper, ironing the freezer paper onto your fabric and cutting with a rotary cutter. I’m going to try this out. If you’re doing this, it might be helpful to use these templates from the publisher that have them organized by block. These pieces are really tiny. I’m using starch to help control my fabric. I find it really helpful to starch and iron my fabric before I trace and cut it out. Things don’t shift as much. I’m currently using Mary Ellen’s Best Press. I have gone through my fabrics and selected prints for eight blocks. I’m not necessarily going in the order of the book, but trying to start with easier blocks while I get the hang of it. 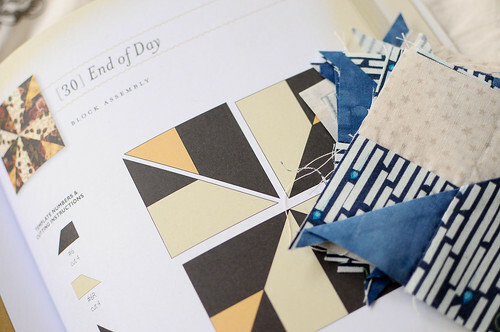 At the beginning of each week, I’ll cut out all the pieces for my week’s blocks so that they are ready to sew. I’m also attempting to hand piece these blocks, but I think I will also try foundation paper piece some of the trickier ones with tiny pieces. We’ll see. I wanted to hand piece because I feel that I can be more accurate with my stitching this way. I also don’t often get to machine sew during the week, so it is easier for me to sit in bed and hand piece before I go to sleep at night. It’s pretty relaxing and super satisfying. Thank goodness for Carolanne and her Intro to Handwork. The skills from this class have done me well over and over. 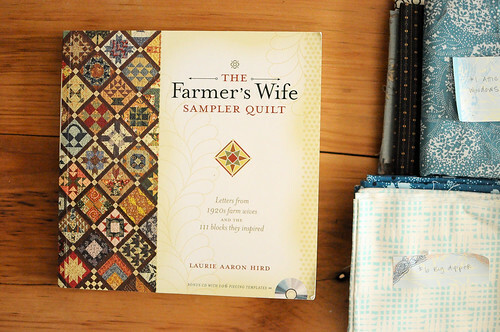 The Farmer’s Wife Quilt-a-long Group is an AMAZING resource. The group was started by Angela & Amanda. There is a wealth of information and discussion. If you have problems I’m sure that it’s been addressed here already, since they are about six months into making the quilt. I did create a Flickr group called The Farmer’s Wife Quilt-a-long Toronto, as a way for us to share our photos with each other, as well. It is so encouraging and exciting to see each other’s blocks as we create them. Please join the group and post your photos! Even if you’re not in Toronto, but just starting out or already halfway done, we’d love to see how you’re doing. Many of us are on Instagram, so there are lots of ways to share our progress with each other. Take a minute to join the group and then introduce yourself here! Have you started? How is it going? Let’s talk about this! I love your quilts and am inspired to start my own much less challenging quilt. 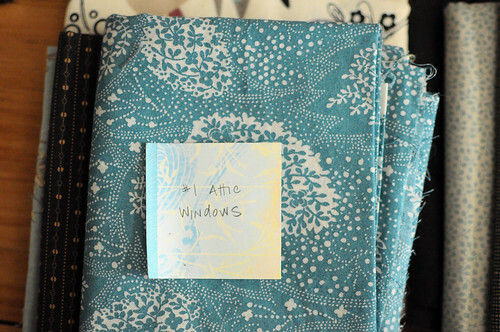 I am gathering up aqua fabrics. What’s that aqua on the top of your stack there? I just love it. Your FW blocks are going to be lovely! I just wanted to flag a potential problem with the block templates that are downloadable from the publisher’s website [https://store.marthapullen.com/t-the_farmers_wife_free_downloads.aspx]: I found them to be undersized, compared with the ones from the book’s CD, printed on the same printer with the same settings. So if anyone is interested in using these (and they ARE convenient, in principle, with all templates for a single block printing on a single page) please do a test page first!! For my test, I used block 33, Farmer’s Puzzle, in which template 29 is a piece that is supposed to run the full width of the block. That template, printed from the downloaded files, only measures 6″. 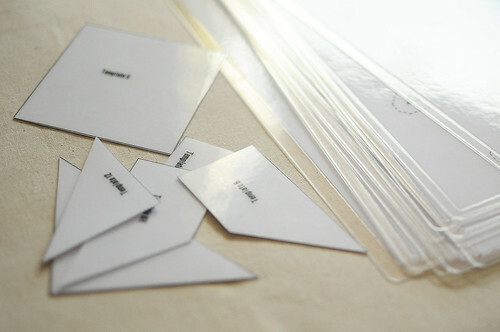 The same template printed from the book’s CD is 6.5″ (the right length). Did you click on “print at 100%” and not “sized to fit page”? That seemed to be a major issue for some. I was wondering about how much fabric you used for this quilt? I am wanting to use 3 Fat eighth bundles, but I didn’t know if this would be enough. Thanks for the information about how to best use the templates from the book!